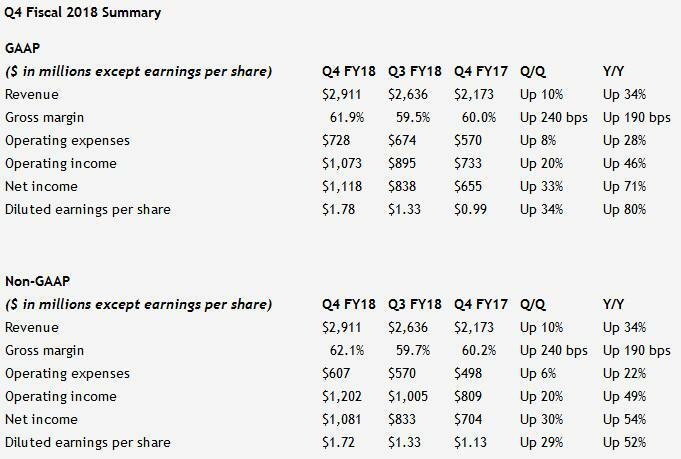 SANTA CLARA, Calif., Feb. 08, 2018 -- NVIDIA (NASDAQ:NVDA) today reported record revenue for the fourth quarter ended January 28, 2018, of $2.91 billion, up 34 percent from $2.17 billion a year earlier, and up 10 percent from $2.64 billion in the previous quarter. - Revenue is expected to be $2.90 billion, plus or minus two percent. - GAAP and non-GAAP gross margins are expected to be 62.7 percent and 63.0 percent, respectively, plus or minus 50 basis points. - GAAP and non-GAAP operating expenses are expected to be approximately $770 million and $645 million, respectively. - GAAP and non-GAAP other income and expense are both expected to be nominal. - GAAP and non-GAAP tax rates are both expected to be 12 percent, plus or minus one percent, excluding any discrete items. 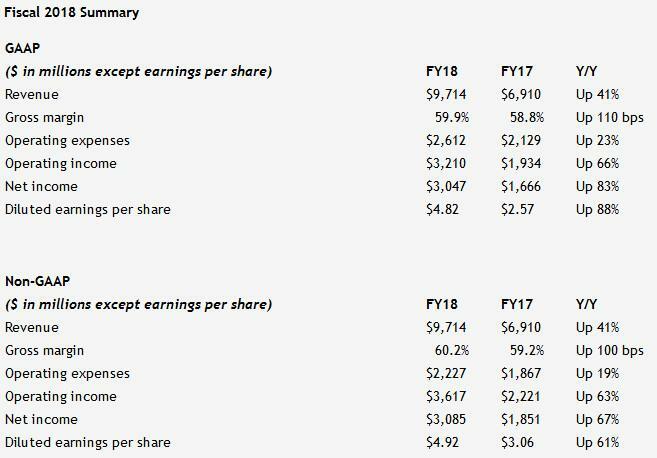 GAAP discrete items include excess tax benefits or deficiencies related to stock-based compensation, which the company expects to generate variability on a quarter by quarter basis. - Announced that NVIDIA Tesla® V100 GPU accelerators are now available through every major computer maker and have been chosen by every major cloud to deliver AI and high performance computing. - Added a record 34 GPU-accelerated systems to the Top500 supercomputer list, bringing the company’s total to 87. - Announced partnerships to further AI in key vertical industries, including initiatives with GE Health and Nuance in medical imaging; Baker Hughes, a GE company, in oil and gas; and Japan’s Komatsu in construction and mining. - Expanded the NVIDIA® GPU Cloud container registry to support scientists using HPC applications, and AI researchers using desktop GPUs. - Announced gaming laptops using the Max-Q design, which are 3x faster and 3x thinner than previous-generation gaming laptops. - Introduced BFGDs™, big format gaming displays, providing ultra-low latency PC gaming and integrated streaming on a high-end 65-inch display using NVIDIA G-SYNC™ technology with NVIDIA SHIELD™. - Enhanced GeForce Experience™ with new tools, including NVIDIA Freestyle for customizing gameplay and an updated interface for the NVIDIA Ansel photo mode, as well as new titles including PlayerUnknown’s Battleground and Fortnite that support NVIDIA ShadowPlay™ Highlights for capturing gaming achievements. 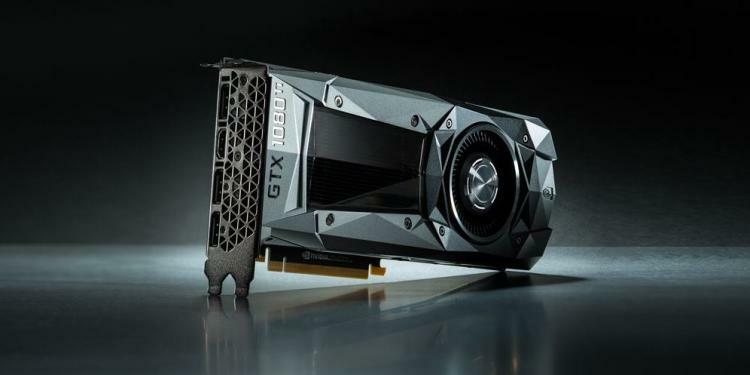 - Increased its GeForce GPU share among gamers on the Steam online gaming platform to 86 percent. - Introduced two new collector’s edition Star Wars-themed NVIDIA TITAN Xp GPUs, tied to the release of Star Wars: The Last Jedi. - Announced and demonstrated NVIDIA DRIVE™ Xavier™, the world’s first autonomous machine processor, with customer availability in the first quarter. - Announced NVIDIA DRIVE, the world’s first functionally safe AI self-driving platform, plus a suite of tools to test and validate neural networks by simulating all kind of driving conditions. - Unveiled partnerships with Uber and Aurora to develop self-driving cars using the open NVIDIA DRIVE AI self-driving platform. - Partnered with ZF and Baidu to create the first production AI autonomous vehicle platform for the China market, with Chery as the first customer. - Partnered with Volkswagen to integrate AI into future VW vehicles using the NVIDIA DRIVE IX intelligent experience platform and create AI cockpits with enhanced convenience and safety features. - Announced NVIDIA is powering the Mercedes-Benz MBUX in-car AI smart cockpit system, going into production next month with the new A-Class. - Announced NVIDIA is partnering with Continental to build AI self-driving vehicle systems, from enhanced Level 2 to Level 5, for production in 2021.